The Right Honourable Ellen Fairclough joined the Zonta Club of Hamilton 1 in March of 1937. She was Canada’s first female cabinet minister and introduced “equal pay for equal work”. She was made an International Honourary member of Zonta in 1990. She died in November 2004, just short of her 100th birthday. 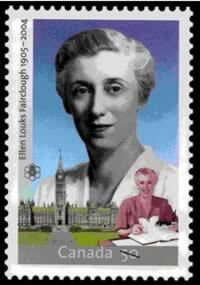 In 1962 Ellen Fairclough became the first and only woman Postmaster General for Canada. In 2005, as a fitting tribute to commemorate this “political pioneer” Canada Post issued a 50 cent stamp with her likeness. Ellen’s niece, Dr. Joan Heels, a Hamilton 1 Zontian arranged for all current members of our club to be invited to the launch.